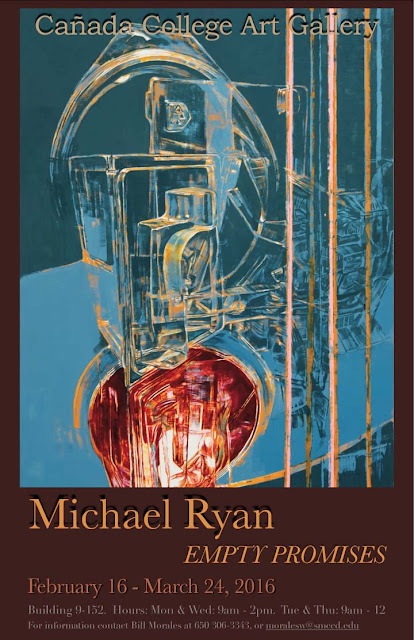 The Cañada College Art Department Presents "Empty Promises"
The Cañada College Art Department is proud to present "EMPTY PROMISES," an exhibition of paintings by Bay Area artist, Michael Ryan. The exhibit is in the Cañada College Art Gallery, located on the ground floor of Building 9, Room 9-152. It runs from February 16 - March 24. Gallery hours are Monday & Wednesday, 9 a.m. – 2 p.m., and Tuesday & Thursday, 9 a.m. - Noon. The present exhibition consists of nine oil paintings representing plastic packaging, in a way that, at times, can be seen as both eerie and beautiful. The artist thus takes this mundane symbol of our throw-away consumerist culture, and causes the viewer to see the beauty in the form and how it takes the light. Michael received his training in Painting and Printmaking at Virginia Commonwealth University and San Francisco State University. He has exhibited his work extensively in the Bay Area since 2005, including the ATA Gallery in San Francisco and the Institute for Contemporary Art in San Jose.